Once the excavation, survey, and architecture teams leave for work each day, the villages are for the most part transformed back into their usual sleepy selves. The sherd yard however, managed by registrar Leslie Hammond (pictured above with a feline friend) and assistants Sarah Linn and Sarah Beckman, becomes a bustling center of activity. The Summer 2010 Field Season began with the arrival of over 40 archaeologists, architects, surveyors and specialists to Mt. Lykaion on June 5th. The group, which will expand to over 60 people through the course of the summer, is a dynamic mix of experienced veterans and fresh faces. After a three(ish) hour drive from the Athens airport, dinner prepared by cook Sam McBride at the Ano Karyes “dining palace,” and a full night’s rest, Wednesday morning began with an orientation to the site and project. See after the jump for pictures of the group preparing the lab and excavation equipment for use and the initial site tour. This week I’ll introduce another exceptional team working at Mt. 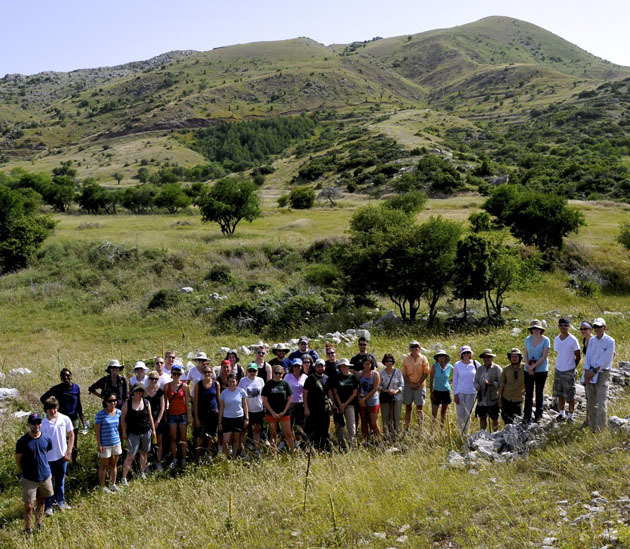 Lykaion: the geologists. It’s a team of just two—Dr. George Davis of the University of Arizona and his able assistant, Karl Yares—but they’ve managed to accomplish a tremendous amount over the course of the season. From field mapping the region to digitally processing all their data to digging their own trench, the geologists did a little of nearly everything. As George helped us appreciate, the geology of Mt. Lykaion and its environs is incredible. Active faults zigzag across the land, and their traces are visible everywhere, at least with someone like George to help us notice them. In some places, compressional forces have caused a plane to fold back on itself in a hairpin bend, so strata can be seen in the reverse of their usual sequence; in others, faulting occurs twice, so that the sequence of strata repeats four times. The geologists piece together the stratigraphy and history of Mt. Lykaion on a much grander scale than archaeologists, of course, detecting events that took place long before the first visitors to the ash altar, old as they are. But the remarkable geologic events of Mt. Lykaion are crucial to deciphering why the first people, when they came to the mountain, did what they did; building structures on a mountain, after all, is fundamentally an interaction of man and geology. Certain geologic features might have influenced the choice to establish a sanctuary in one mountainside meadow rather than another. Tectonic activity on the mountaintop might have contributed to the awe with which the ancients regarded the place. The geologists can also determine which rocks are native to the mountaintop and lower sanctuaries and which must have been carried from elsewhere by human hands. Over the course of this season and the next, George and Karl are excavating at the ash altar to expose the fault that runs across the mountaintop. George has also contributed to the project’s development of a proposal for the Parrhasian Heritage Park. Parrhasia, a name with Homeric roots (Il. 2.608, e.g. ), refers to the area of southwestern Arcadia and beyond in which not only Mt. Lykaion but myriad other ancient cities and sanctuaries are located. 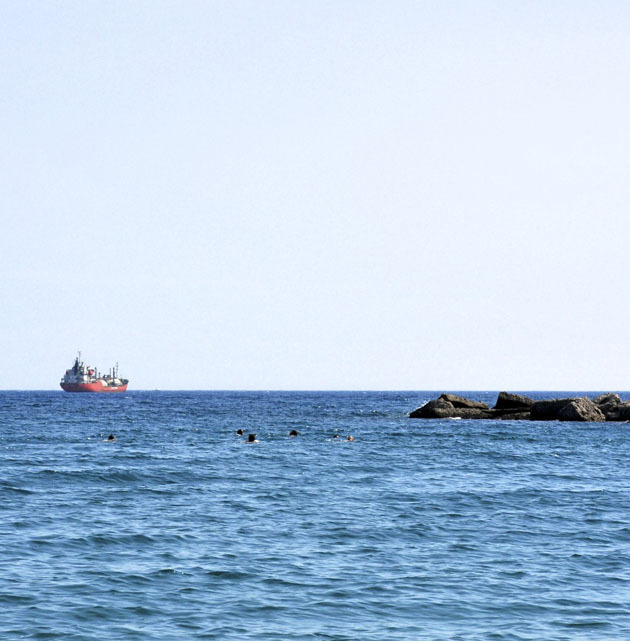 Within the scope of the proposed park—which would span 300 square km in southern Elis and northern Messenia as well as in western Arcadia—fall many of the sites and scenes we’ve grown to love over the past weeks. There’s nearby Phigaleia, the city we visited in the second week of the excavation, which boasts not only the fountain house but a Temple of Athena. Not far from the temple we could glimpse the Neda Gorge, with its breathtaking view straight to the Ionian Sea. On our Sunday excursion of the week, we visited three other important sites that fall within the proposed park: Lykosoura, Trapezus, and the city of Megalopolis. The city of Lykosoura, which Pausanias claimed to be “the oldest city in the world,” is notable for its Sanctuary of Despoina (a goddess related to Kore, a daughter of Demeter) and so-called Megaron complex. Trapezus, in the Megalopolitan plain, is thought to be one of the first Greek cities to be laid out on a grid; Megalopolis, one of the cities founded by Epaminondas after his victory at Leuctra, held the largest theatre in Greece, quite well-preserved to this day, a vast agora, and numerous temples. The region’s delights, though, are not only for classical archaeologists. There are many sites of more recent historical interest nearby, from the Frankish fortress at Karitaina to the many lovely Byzantine monasteries that pepper the landscape; on the other end of the spectrum, there are sites of paleological significance in the Megalopolitan plain. But the area is also attractive simply for its natural beauty, with rugged mountains and rich forests, and for the glimpse it affords of traditional Greek life that is not to be found on the more touristed isles. The proposed park is designed to reflect this multiple heritage, then, not just one aspect of it. A visitor’s center would make information about the area available to tourists, while a series of paths and trails would allow travellers to enjoy more of the region on foot. We have a great team working on the proposal; in addition to the project co-directors and George Davis, landscape architects Mark Davison and Danae Whipp, although they weren’t able to make it out this season, have been invaluable in spearheading the proposal and are now working on a brochure; Dr. Barbara Morehouse of the University of Arizona spent a week at Mt. Lykaion offering insight; Ximena Valle on the architecture team has been designing prototypes for informational signs to help guide visitors through the park. Perhaps most important, though, has been the support of the mayors and citizens of the towns that fall within the proposed park. Program co-directors David Romano and Mary Voyatzis went all the way to Athens on June 14th to speak about the park proposal at the War Museum for the meeting concerning the 10th re-enactment of the Modern Lykaion Games that will take place in August 2009. Their warm reception there and throughout augurs well for the park’s creation and, with it, more visitors to this wonderful corner of the Peloponnese. have a team of architects. architecture team and relate some of her insights. Everyone on the project can see that the architects are never idle. They draw in the mornings, and in the afternoons, when most of us are working inside, in our lab, the architects usually head back to the hot field for another drawing session in the afternoon. Then, when they aren’t in the field, they’re performing some complicated-looking operations on the computer. Ximena, who’s been with the project since 2006, explained to us what exactly they’re doing. In the field, the architects have been drawing every visible structure at the site one block at a time. Each block is drawn twice, in plan and in elevation, at a 1:10 ratio, which can capture every detail of the blocks’ edges as well as cracks and limestone veins on the surface of the stone. The drawings not only capture detail too minute for photographs, they also correct for the distortion of perspective inherent to photographs. Over the course of the past five field seasons, the architects have already completed the xenon, steps, and fountain house, as well as other blocks of architectural significance, such as the column bases in the temenos, and even “rubble blocks” that were once clearly part of a structure but have since fallen out of place. Now, they’re drawing the stoa and the bath house complex at the far end of the hippodrome. The architects also called in to help the excavators when blocks, column drums, and other architectural features are exposed in the trenches. In the lab, the architects gather together all the drawings they’ve produced—each done by a different hand, but each lining up exactly with the others—scan the drawings, and digitally stitch them together with Adobe Photoshop into a plan and elevation drawing of an entire structure. After some adjustments using Illustrator, points on the drawing are correlated with the topographical survey team’s geo-referenced points on AutoCAD. The result is a topographical map of the entire site which contains detail as minute as a fissure in a block. The architects are also beginning to brainstorm possible reconstructions of the fountain house in Mt. Lykaion’s Lower Sanctuary. Everyone had fun participating in their field research for this project: last Saturday, we visited the nearby city of Phigalea, which contains the remains of a fountain house of a comparable age to the one at Mt. Lykaion. At the neighboring site of Lykosoura, too, much of a large fountain house remains intact; visiting this site also gave the architects ideas. We’re all excited to see what the architects will come up with and impressed by the team’s tireless dedication. Our first few days of digging held a surprise for us: miserable weather. Those of us in the field had to contend with low temperatures, high winds, driving rain, and even occasional hail. Who thought we’d need to pack raincoats and polarfleeces for a summer in Greece? But there was probably a reason that Zeus the storm-god wasn’t known for his constancy. At the Ash Altar, where the wind can be fierce even on the sunniest of days, blowing ash and icy fingers made screening the soil difficult; gusts also posed a challenge for the survey team. In the Lower Sanctuary, where the trenches are deeper, the rain made for messy digging. We came through the first few days smiling, though, and the rain and cold soon gave way to the dry heat of a typical Greek summer. By Sunday, the weather couldn’t have been more perfect for our first weekend excursion, a 2-hour hike from our site to the Temple of Apollo Epikourios at Bassae, visible from the top of the Ash Altar. When we arrived, project co-director Mary Voyatzis treated us to an overview of the site’s important features. As Mary explained, the structure visible today, which is remarkably well preserved, dates from about 450 BC and was designed by Ictinus, one of the architects of the Parthenon. The temple stands out architecturally for many reasons, including its north-south orientation (most Greek temples run east to west) and the presence of all three major orders of column, Doric, Ionic, and even one Corinthian capital, the earliest known in Greece. The friezes from the temple, which depict the two famous battles of Greeks with Amazons and Lapiths with Centaurs, are now in the British Museum. From Bassae, we continued by van to the seaside resort of Kalo Nero, where we enjoyed a Greek lunch of saganaki, calamari, and other traditional mezze (small plates). We ended our outing with a dip in the Ionian Sea. Our workdays are long—we typically have breakfast at 6:15, leave for the site at 6:45, and return for lunch at 1:30, then work in the lab or return to the field in the afternoon—but we do manage to squeeze in some extra-archaeological activity. A running group, the Striders, is organized by co-director David Romano, who regularly competes in both the Penn Relays and in the Modern Lykaian Games, held in our site’s hippodrome. Three times a week, we meet for runs, often demanding given the high altitude and steep hills, but the views across Arcadia from the north face of Mt. Lykaion make the effort worthwhile. In the evenings, Nicky Pasterfield has been offering a series of Modern Greek lessons, equipping us with the phrases we need to greet the residents of our village courteously and to get along during our shopping and dining excursions to Megalopolis. On some evenings, we even find time to unwind on the village plateia with a drink and a backgammon board.